Offering these words and all our experiences at the feet of Bade Baba for His constant love, guidance, protection and support. Here i am today, back after a mesmerizing, refreshing, and blessed trip from Bade Baba's abode in Kanhangad. Bade Baba is everywhere, then why Kanhangad? Sure he is, but this is the place where he himself spent quite number of years before he left to Ganeshpuri leaving it at the hands of Swami Janananda who later developed this place to close to what it is today. On my first visit, i never ever knew things would change spiritually so much and this is what pulled me here for the fifth time, every time having the divine company of more and more seekers. (Read previous visits) As all other visits, this visit also was for a divine purpose and i am sure all those who came here also have their own bunch of gifts now or in the coming time :) For me, this place has been a very powerful and divine source to connect with Bade Baba. This place has those high energies which when one gets into, it becomes easier to connect to any divine being. This time after a few indications the dates were fixed for me to leave and it was put up on the blog. I wasn't expecting more than 5-6 people but we had 16 seekers this time, but the only difference was that even though the trip was fixed only a week before and many could not make urgent arrangements, still many of them atleast made it for a day after which they returned; which shows the spirit and call of this enchanting place. Only 8 people stayed back for all the three days, few left after one day and few after two days. As usual, this trip from start till the end had only miracles and wonderful happenings. Tickets were easily booked at the nth hour, if someone dropped their plans coming at the last minute due to unavoidable circumstances, there was somebody else who popped in at the last minute. This time we had, from Bangalore - Malliga aunty, Ravi, Geetu, Puneet and a last moment entry of Pintu who just joined the last moment without a ticket and things got arranged in the train itself. Satyaprabha aunty who was almost disappointed at her last moment cancellation due to job work, found herself in the train to atleast make it for the Sunday. More surprisingly, two girls from Bangalore Geeta and Dipti left from Bangalore the last moment in a bus and reached Kanhangad on their own; though it was their first trip here. Ravikumar from Bangalore also came on his own one day earlier. Also two days earlier a couple Krupa and her hubby had reached who preferred coming early because of their schedules. Two long distance seekers also were there with us for 3 days - Shruti from Delhi and Ashutosh from Kolkatta who flew to Bangalore and boarded the train with others. i reached Mangalore early morning 5:30 and as usual went to uncle Vishwanath's house where he and Taqueela (his German Shepherd dog) waited. i have a great time with Taqueela always. Uncle said he would not be able to join us as someone in his home was ill and admitted and i can only offer my love as gratitude for the love and care he offers for our journey here everytime. Though noone else was at his home, he insistingly made tea and bread toast for breakfast. He and me, both bad cooks, made each other burnt toasts with ghee and had it without complaints with giggles and laughter. Uncle then came to drop me at Mangalore station on the morning of 19th June where Arjun also joined us. At 8:30 a.m.the train arrived in which all other seekers from Bangalore were there. i cannot described the feelings when one meet people of similar frequencies. Soon there were hugs and laughter on the platform as Ravi bought everyone idlis after which the train moved. Uncle Vishwanath bid us goodbye as he returned home with a face that showed how much he missed coming with us. From here the journey began, the fun, the thrill, the connections. All said that they could feel the vibrations even as the train was closer to Kanhangad. The climate here was sunny and of the three days we stayed here, not a single day did it rain thus making it very easy for us to visit places and do sadhana in open places. We reached Kanhangad by 10:30 and took autos to the ashram. Ganapathyji was kind enough to arrange everything for us and had left the rooms open for us while he had gone to Guruvan with the couple who had come 2 days earlier. Soon, everyone freshened up and a quick plan was made how to work out things as people were staying for 1, 2, and 3 days. Geeta and Dipti said they had only one Sunday and could not adjust at any cost a single more day, but by the end of the day they made if for another day as they wanted to visit Guruvan the next day. The places of visit and interests are already mentioned in previous posts, so i would not make a repeated mention of it here. (Read previous visits) What i wish to focus more on this time's visit is the awe of seeing so many seekers; moreover this was not an organized trip but was just a personal visit, but soon that turned into a happy group visit together. This time, 10 out of 16 seekers were first-time visitors here but what i noticed with all of them this time were that all were very dedicated in each and every activity that happened there. The first day we went up the Samadhi temple for arati, then Janananda Swami's Samadhi temple for the arati and then a delicious meal at the Annapurneshwari Hall. The meal only contains of simple polished rice and sambaar with a spoonful of curry and a pickle, but that is all that one needs to have a fulfilling yet light meal. After that we all went into the caves and then we sat talking for sometime. Luckily there was the same team of satsang with musical instruments, whom we had encountered last time who sing only for 30 mins. When they said, we could sing something, we seized the opportunity by singing "Samba Sadashiva" and "Hari Hari bol". We ended the satsang with "Jai Jai Aarti Nityananda". Quickly, we planned for the next day's move and it was going to be quite a busy day since we had too many things to do and places to cover. From the time we entered the ashram the vibes could be felt. Ravi, Geetu, Puneet and Satyaprabhaji left since they had only planned for a day. Next day, we all woke up at 4 a.m. and reached the Nityananda Swami Samadhi temple situated above the caves by 5 a.m. Soon the priest came in and the Milk and tender coconut abhishekham of Baba Nityananda began, which was a blissful experience. This is the only time one gets to touch (bathe) the panchaloha statue of Bade Baba. 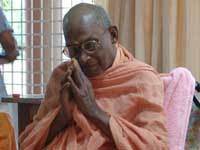 After this was the milk abhishekham of Janananda Swami. Breakfast began after this which is as early as 8 in the morning. After breakfast we continued sitting in the same place talking of the stories and leelas of Bade Baba in and around Kanhangad and Mangalore. By then, it was time for the Gana homam and Mruthunjaya homam which was for an hour and this was blissfully divine being here doing the homam in the Kerala way. For homans, one has to make the necessary contributions and take vouchers the previous day. One person can do the homams for themselves or even extend it to their family members. This voucher is then presented to the priest who keeps it at the feet of Bade Baba and the next day performs homa with everyone around in the names of those in whose names the vouchers were. i have found this homa a very wonderful experience all the times i visited here. After the homams and taking the prasad, we left towards Padiyar Swami's house guided by Ganapathyji. We paid homage to Swamiji's samadhi in the compound of his home, where Bade Baba had directed him to stay all his life doing seva. We walked into the house that seemed welcoming as ever with vibrations of peace and tranquility. After a walk through all the rooms, each settled down in the places they "felt" like sitting. After meditation, we gathered back in the hall and talked for a while and sung "Achyutham Keshavam..." and "Jai Jai Aarati Nityananda". It was 2:30 in the afternoon and we planned to now leave as we had to go to the ashram, have food and leave from Guruvan. On the way back we did not miss sitting at the conference table built by Bade Baba, where he sat and shared inputs of incidents that were yet to happen. We then reached the ashram, had lunch and left for Guruvan. The experience to this time's visit to Guruvan was just splendid! This time it was even more wonderful because the new temple was built and the new idol was installed. (Read) This time the caves had something new than the last time. As we all went into the caves, i noticed that the caves had more water due to rains and also the sides of the caves looked wider, which i felt was probably due to the cleaning work done around here. This time we observed more space in there to go further and be able to stand for last time i remember we were all almost on knees. This time the girls had the lead with torches in their hands in the pitch-dark tunnel. Shruti, Geeta and Dipti. i was awed to see these girls had almost reached where the bats where very close upside down and these were visible when the camera flash flashed onto their shining eyes staring at everyone. After we came out the second set of people went in and came out. Shruti then stated that she wanted to sit a while in the dark cave. Now, this had never struck to me ever during the previous visits here, so i joined her and we went to the end of the dark cave and sat in total pitch darkness offing our flashlights. Meditating sitting on the wet muddy rocks in total darkness in this divine cave was beyond words. After about 30 minutes we came out and meditated at the entrance of the cave while others were spread out in and around the temple meditating. Soon it was time for arati in new temple and we went down where Swami Vidyananda did the arati and offered everyone the teertha. i told him about the caves looking wider and more comfortable and asked about the cleaning process that could have been done. i was taken aback when he replied that noone touches the caves for any reason as they want it to be as it was since it was Bade Baba's place. The ones who had visited last time knew this could not be really true since all had noticed that the cave structure was looking different and was more accommodative. Swami Vidyananda just smiled and said "He" only knows what it is and insisted no work has been done in the caves. With a eye-widened look at each other, with curiosity and excitement but still not wanting to analyze anything we moved from the place. We requested Swami Vidyananda that we wanted to see the old statue also of Bade Baba that was in the old temple and he was kind enough to show it in the room that was kept locked. Then since two of them had to leave this evening after a day's extension of their unplanned trip, we took leave of Swami Vidyananda and left the beautiful place. Ganapathyji had joined us here too and it was nice to have him with us as he made arrangements for our travel by calling up autos, etc. We reached the ashram and then resumed attending the aratis at both samadhi temples. This night few of us spent talking at Nityananda Baba's Samadhi temple while few were in their rooms. Here we decided that next day early morning 5:30 a.m. we would meditate in the caves as and when one wanted and then in the morning after breakfast we would visit Anand Ashram of Ramdas Swami, another divine place one must visit once if you are here in Kanhangad. So, did it happen and after time in the caves the next morning, after breakfast, we left for Anand Ashram around 6 kms from here. Every time we come here, we have come in late evenings and this was the first time we came in broad daylight. This ashram was started by Swami Ramdas (also known as Pappa) who was an enlightened being and i have found him all the places i have been travelling which shows his strong connection - in Padiyar Swamiji's house, in Vijayanand Swami's ashram in Bevinkoppa and even when we were in Tiruvanamali Hills i was surprised to see that Pappaji even did tapas in one of the caves of Ramana Maharishi. I asked how to Swamiji how Pappaji had been in Tiruvanamalai Hills and he said that Pappaji went for tapas in caves after having a vision of Ramana Maharishi and it was here that Pappaji had his enlightenment. This was mentioned by Pappaji once that during the opening of this ashram which was almost at the same time Bade Baba was building the caves, Bade Baba was invited for this opening and Baba at a time walked in and sat down with everyone around him. He sat silent. He was offered a tender coconut and he quietly drank it. After sitting there for about 10 minutes in absolute silence, Baba got up and left. 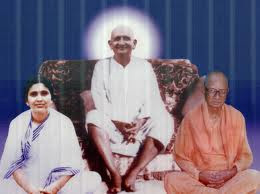 We had come before thrice here but never got an opportunity to meet the current Swamiji - Swami Muktananda, who looks after the ashram after the Samadhi of Ramdass Swami, Mataji, and Swami Satchidananda but never could meet him because he was either not there or busy. But this time, as we entered on speaking to a sevak at the gate in Malayalam for guidance in the ashram, he asked us to go to information center first. As we walked towards it, he came along with us and said that if we wished we could meet Swamiji after going to the information center and i immediately told him that we would meet Swamiji first and he immediately took us to the room where he was sitting. We took blessings from him and sat as he enquired from which place we were from. On telling him that we were from different places in India, he laughed and asked us to sit. His messages then were very, very simple, universal and clear. As he spoke with great care and love he cited practical examples of overcoming certain situations in the spiritual life. His basic and most simple message was of loving anything and everything around and carrying the constant awareness of how alive everything is by offering gratitude to every little thing that we encounter in our life. He mentioned about carrying the gratitude because with that emotion one would acknowledge constantly the presence of divinity in that person or thing. He gave few examples of how to even own gratitude to the envelope that brought a letter safely in it to you, owning gratitude to the spoon and plate that serve us constantly, etc. He continued giving more practical examples of daily life - that if you go to any toilet and when you see no latch, you realize how importance that latch is, further if there is latch and no bucket or mug how important that bucket would be or if everything is there and there is no pipe for water. As he spoke this straight example one could deeply know the importance and relevance of every single thing there. i was getting aware of the floor, the light, the air, the clothes, and every little thing around me and the importance of it as he spoke. How true it is that all these things that are easily taken for granted. Swamiji said that by developing this awareness and feeling all the time one would gradually start seeing the divinity in everything. This ashram is where the Rama Nama chanting goes on incessantly, by which the mantra slowly seeps in, Swamiji said. He also said that when you chant any mantra constantly it seeps into your consciousness and brings the changes. He said there are three types of chants or rather stages of chanting - verbal (chant that can be heard), internal (chant that goes on in the mind with or without lip movement), silent (internal chanting). Swamiji only talked about universality and the wellbeing of every living thing, samastha loka sukhino bhavantu. The love that he spoke was, was quite evident in his speech and actions. After about an hour in here, Swamiji blessed us with biscuits and some reading material and invited us to come and stay for a day or two the next time we came here. He then guided us briefly on the places to visit in the ashram. Whole-heartedly thanking him, we left the room. We then went to where all cow shelter and there were about 40-50 Jersey cows. All were so cute and all had individual name boards behind them. We then took out our biscuit packets and after eating from as prasad from Swamiji, offered the rest to all those cows who were just relishing it. Then we moved to the satsang hall, which is a very divine hall and you can sense it the moment you enter. Here we also got to get into the room in which Pappaji stayed and this room has very strong vibrations that is quite obvious. This room contained his bed, chairs and other daily use materials. After being for with the chanting and meditating, we then moved towards the three samadhis of Pappaji, Mataji and their disciple Swami Satchidananda, where chantings are constantly going on. We had time to sit for a good time in all three samadhi places. From there, we went to the library and then moved towards the mess, where coupons were given and we were soon sitting in the mess. We had a very satvik meal here, washed our plates and soon left back to the ashram. i am very grateful to Ganapathyji who never comes here but this time on our insistence joined us and took us around to all these places we had never visited before. On reaching the ashram, everyone got busy packing their stuff since evening was everyone's train back to Bangalore and me and Arjun were also supposed to get in the same train till Mangalore from where i had my bus at night back home. These last few moments we spent time in Swami Janananda's room which is one of the best spots here to meditate and then meditated for sometime in the caves. Finally, at 4:30 p.m. my purpose of this time's visit seemed crystal clear and evident and we took leave of the ashram people and Ganapathyji. We then reached the station and boarded our trains back to our destinations. While in the train, the ever concerned and loving Vishwanath Uncle called up and said he would come to pick us up. He did and we were soon at his home, as usual, being stuffed by chapatis, curry, fruits, sweets and what not. No one can escape Uncle's forced love of food treat, not even Arjun who had perspiration gulping down the badam milk that uncle made him drink after he had stuffed about 4 chappatis. I could hear him squeakingly telling me that he has never had more than two for dinner. i promised uncle that next time i come i will take an oath from him before entering and his laughed confidently conveyed that there would be no escape, come what may. Here is a video of brief clippings of the 3-day visit.